A scenic view of Bueunsa Temple from the surrounding mountains of Mt. Cheontaesan. Continuing with the weekly celebration to the lead-up to Buddha’s birthday this Monday, I thought I would share yet another one of Korea’s beautiful Buddhist temples. This time, I explored Bueunsa Temple. Buensa Temple (부은사) was the last major temple I had yet to visit on Mt. Cheontaesan. I was told by an English speaking monk at the temple, whose English was excellent, that the temple dates back 1800 years. And it was first established during the Gaya Kingdom from visiting monks from India. When you first arrive at Bueunsa Temple, after making your way up a steep gravel road, you’ll be greeted by the temple’s dorms and kitchen. Behind this building, and to the left, is the temple’s main courtyard. Immediately, you’re greeted by a modern looking Yongwang-dang dedicated to the shaman deity, Yongwang (The Dragon King). There are two oval glass windows that allow you to look inside the hall without actually going inside. Inside of this hall, there’s a nice painting of Yongwang with a statue of Okhwang-sangje (The Daoist Jade Emperor) to the left. To the rear of the Yongwang-dang is the Samseong-gak shrine hall. Sitting on the main altar of this newly established hall is Chiseonggwangyeorae-bul, and he’s flanked by Ilgwang (The Bodhisattva of the Sun) and Wolgwang (The Bodhisattva of the Moon), which are backed by an older mural of Chilseong (The Seven Stars). Flanking this triad of statues is San shin (The Mountain Spirit) and Dokseong (The Recluse). There are also some nice new murals of the Nahan inside of this hall. To the right of these two shaman structures is the natural wood looking bell pavilion. The bell pavilion houses some impressive Buddhist ceremonial music instruments like the Braham Bell and the Dharma Drum. Interestingly, and in front of the bell pavilion, is a map of what the head monk wants the temple to eventually look like when it’s completed. Next to the bell pavilion is the main hall. It’s surrounded by some nice Palsang-do paintings of the historical Buddha’s life. Interestingly, I met the man that painted them, Mr. Gwan, because he had just completed them the day before. As for the interior of the main hall, and sitting on the main altar, is a set of five statues. In the centre is Birojana-bul (The Buddha of Cosmic Energy). He’s flanked to the left by Seokgamoni-bul (The Historical Buddha) and Yaksayore-bul (The Medicine Buddha) to the right. And to the far left is a golden haired (Jijang-bosal) and Gwanseeum-bosal (The Bodhisattva of Compassion) to the far right. To the left of this altar, and harkening back to the temple’s origins, is a sign dedicated to King Suro, the founding king of the Gaya Kingdom. 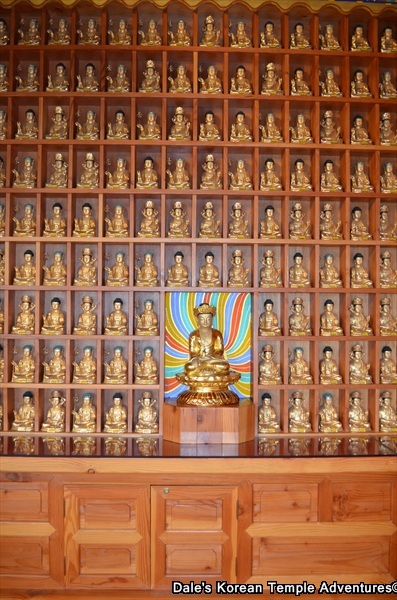 The altar is surrounded by a beautiful canopy and hundreds of tiny golden statues of various Buddhas and Bodhisattvas. On the far right wall, there’s a beautiful large guardian painting. This is fronted by Dongjin-bosal (The Bodhisattva that Protects the Buddha’s Teachings). This is the most impressive statue of this Bodhisattva that I’ve ever seen. It was at this point that the head monk at the temple spotted me. He yelled out of the main hall to someone that a foreigner was visiting. It was at this point that I met a nice monk that speaks flawless English. He told me a lot about the temple and a hidden treasure at the temple. There’s a statue of Amita-bul (The Buddha of the Western Paradise) in the monk’s quarters. This statue is over 300 years old. And it’s accompanied by three murals that date back 80 years, the most notable being the mural on the left dedicated to San shin. The other two murals are dedicated to Amita-bul and the Nahan (The Disciples of the Historical Buddha). And in front of this statue and mural are the purported remains of the historical Buddha, Seokgamoni-bul, that the head monk paid a lot of money in Nepal to bring them back to Korea. In the future, and as part of the temple plan, there will be a pagoda that will be built to house these remains. It was thanks to the English speaking monk, that I was able to see all of the temple’s hidden treasures. As for the rest of the temple grounds, there is a Nahan-jeon dedicated to the Disiciples of the Historical Buddha to the right rear of the main hall. There are some interesting statues of the Nahan riding elephants inside of this hall. Also, there is the triad of Seokgamoni-bul in the centre. He’s flanked by Jaehwagalra-bosal (The Past Buddha) to the left and Mireuk-bosal (The Future Buddha) to the right on the main altar, and beautiful murals of the Nahan surrounding this central triad. 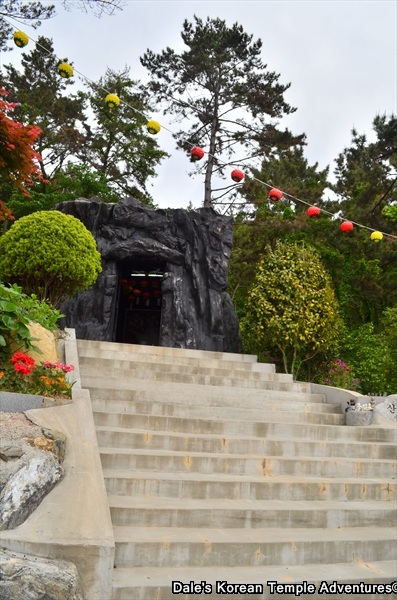 Up the mountainside, and to the right of the temple grounds, is a cave with a triad of statues inside. The climb is about 1.5 kilometres, but it provides for some amazing views of the temple, the Nakdong River, and the sprawling valley below. 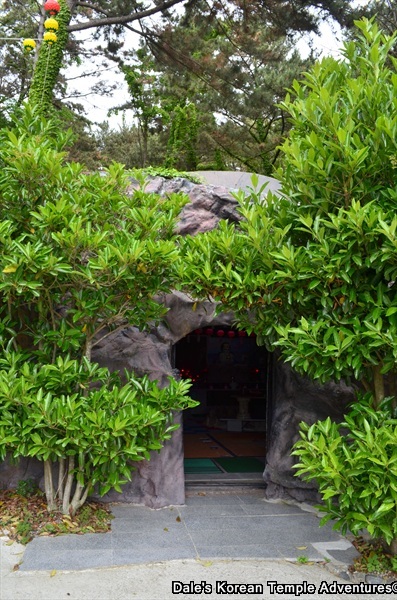 As for the cave itself, it’s a rather deep cave with a protective cover over top of its entrance. The triad of stone statues that sit on its altar are Yaksayore-bul (The Medicine Buddha) in the centre. 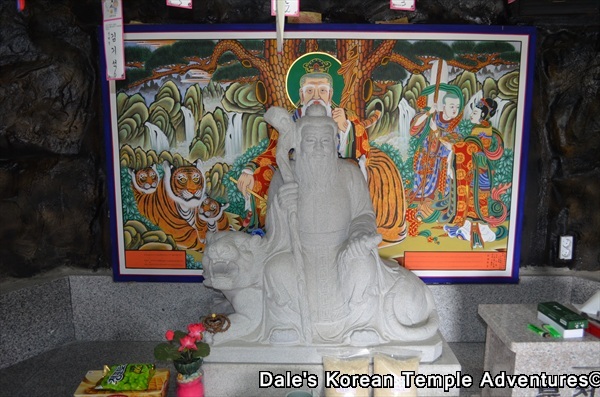 He’s flanked by Dokseong (The Recluse) to the left, and Mago Shin Seon (A shaman spirit), which is an extremely rare deity to see at a Buddhist temple. HOW TO GET THERE: Unfortunately, unless you have your own car, or you can hitch a ride, this temple is impossible to visit through public transit. Hopefully, if you’re interested enough to visit, the map below will be enough of a help to find this remote temple. OVERALL RATING: 7/10. Just for having an English speaker as a monk alone, this temple rates as highly as it does. It’s so nice to be able to talk to someone that can explain the intricacies of the temple’s history. Also, the kindness of the monks to allow me to see the temple’s private treasures like the Amita-bul statue and the San shin painting are two other highlights to this temple. This temple is littered with shaman deities, a gorgeous main hall, and a cave shrine, which only help enhance this temple’s overall rating. And yet, it’s not even complete. I can only imagine just how amazing this beautiful, but humble, temple will be when it’s completed. The beautiful main hall at Bueunsa Temple. The head-monks vision of what the temple will look like when it’s completed. One of the murals from the Palsang-do set. This one is the last of the eight, which depicts the Buddha’s earthly demise. The amazing interior of this Taego sect Buddhist main hall. The large guardian mural with Dongjin-bosal to the left. The three hundred year old statue of Amita-bul (The Buddha of the Western Paradise) in the centre inside the monks’ quarters. The purported earthly remains, sari, of Seokgamoni-bul (The Historical Buddha). The obscured San shin painting from inside the monks’ quarters. This painting is over 80 years old. The shaman shrines at Bueunsa Temple. In the foreground is the Yongwang-dang, and in the background is the Samseong-gak. 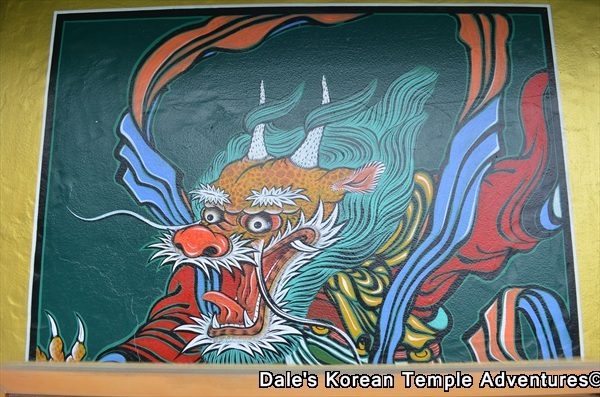 A look inside the Yongwang-dang at the mural of Yongwang (The Dragon King). A look inside the Samseong-gak shrine hall at the main altar inside the hall. One of the murals that sits upon the walls inside the Samseong-gak shrine hall. The view from the Samseong-gak shrine hall at the temple grounds and the valley and river down below. The view from the trail head that leads up to the cave shrine on top of Mt. Cheontaesan. You get a good look at the newly constructed Nahan-jeon. A look inside the Nahan-jeon at the main altar pieces. The statues and murals that depict the various Nahan (The Disciples of the Historical Buddha). The hazardous mountainside trail that leads up to the cave shrine. The view from the mountainside plateau as you near the cave shrine. And a look inside the cave shrine at the altar. The stunning seven tier pagoda hall at Yeongsanjeongsa Temple. 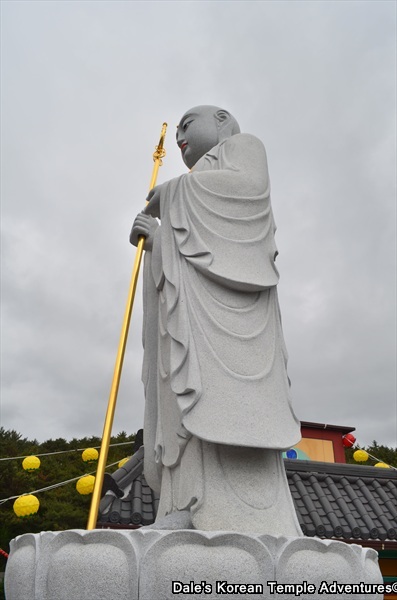 Up a very long country road, you’ll finally arrive at Yeongsanjeongsa Temple on the northwestern outskirts of Miryang. And with it placed not too far from my town, I thought I would explore yet another of Gyeongsangnam-do’s hidden treasures. However, long before you ever come close to the temple grounds, you’ll be able to spot a gorgeous structure reaching up towards the sky. This structure, which dominates the temple grounds, is the seven tier pagoda hall. The first thing to greet you at the temple is a rather non-descript Iljumun Gate. After passing through this, you’ll be greeted by a couple of stone spiritual guardian poles. Finally, you’ll have arrived at the rather spacious temple courtyard. To your immediate left is a large building that acts as the monks’ dorms, kitchen, and visitors’ centre. And to the right of this modern looking building is a beautiful statue of Gwanseeum-bosal (The Bodhisattva of Compassion). He’s surrounded by a shallow pool of water and two attendants that are standing chin deep in the water. Housed between the statue of Gwanseeum-bosal and the Myeongbu-jeon hall is the amazing seven tier pagoda hall. It is remarkable for a couple of reasons. First, it acts as a sort of museum for the temple. Around the concrete pagoda are various Buddhist statues and vases. Inside the pagoda (which is 2,000 won to enter), and on the first floor, is a hall filled with prominent historical monks throughout the ages in Korean history. Also, there are numerous large statues on the first floor. On the second floor there are numerous paintings from various temples in the area. And on the third floor are a world record setting amount of sari, monks remains, which occupy the entire floor in display cases. And on the fourth floor, the final floor to display anything, are numerous Buddhist statues. Finally, on the fifth and final floor that you can explore, is a bit of an observation area that you can see the temple and surrounding valley below. The two main halls at the temple are next to the seven tier concrete pagoda. When we arrived, they were preparing for Buddha’s birthday, so a canopy of colourful paper lanterns had already been mounted. They were framed by a pair of rather plain looking nine tier stone pagodas. On the left is another concrete hall at Yeongsanjeongsa Temple. This time, it’s the Myeongbu-jeon hall dedicated to Jijang-bosal (The Bodhisattva of the Afterlife). The exterior of the hall is adorned with very simplistic paintings of the Ten Kings of the Underworld. They must have been saving their money on these paintings, because the paintings inside of this hall are some of the most original I’ve ever seen in all of Korea. Sitting on the long altar are seven statues of Jijang-bosal backed by amazing paintings of this Bodhisattva with various depictions of hell at their base. To the far left is a wall of gold to commemorate the dead, while on the right is a stunning painting that depicts the various stages of the journey from hell to heaven (very Dantesque). Between the Myeongbu-jeon and the main hall is a man-made waterfall that houses what looks to be a moon rock carving of various Buddhas and Bodhisattvas on it. Surrounding the exterior of the main hall are the Palsang-do paintings that depict the ten stages of the historical Buddha’s life. As for the interior, and sitting on the main altar, are five of Korea’s most original paintings of Buddhas and Bodhisattvas. In the centre is Birojana-bul (The Buddha of Cosmic Energy). He is flanked by Mireuk-bul (The Future Buddha) to the left and to the right is Seokgamoni-bul (The Historical Buddha). And on the farthest two sides from the centre are Yaksayore-bul (The Medicine Buddha) on the far right side and Amita-bul (The Buddha of the Western Paradise) on the far left. The spacious main hall has a newer looking painting of Chilseong (The Seven Stars) on the far right wall and the temple’s guardian painting. 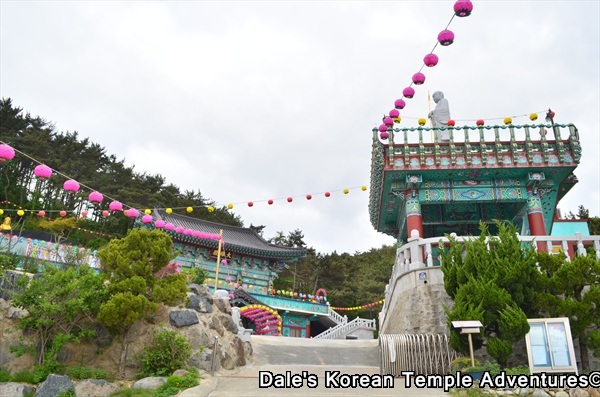 As a bit of a side note, the temple is a couple of kilometers away from the birthplace of Sa-myeong-daesa, the warrior monk. Admission to the temple is free. 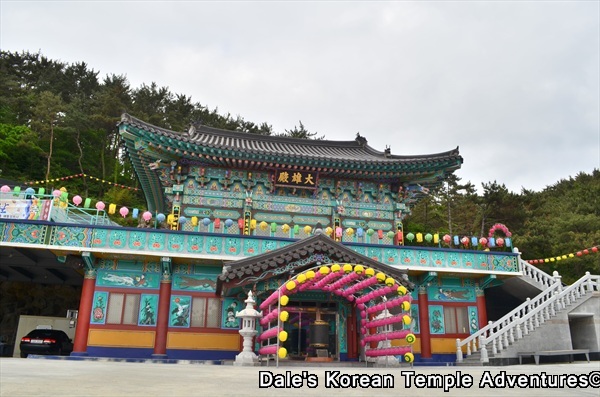 HOW TO GET THERE: You can get to Yeongsanjeongsa Temple only by first arriving in Miryang, Gyeongsangnam-do. From the Inter-City Bus Terminal in Miryang, you’ll have to catch the “Seogeojyeong” bus. The bus ride will take you around 40 minutes, and you’ll have to get off at the Seogeojyeong stop. From this stop, you’ll have to walk about 10 minutes to get to the temple. It’ll be easy enough to see because the top of the pagoda protrudes forth from the valley. OVERALL RATING: 7/10. For the seven tier pagoda hall itself, this hall is rated as highly as it is. Added to it are the contents of the pagoda as well as the interior of the Myeongbu-jeon and the main hall, and it only adds to the temple’s overall rating. A look at the temple courtyard as you first enter it. The statue of the stoic Gwanseeum-bosal (The Bodhisattva of Compassion). An up-close look at the beautifully sculpted statue of Gwanseeum-bosal. And a better look at the stunning seven tier pagoda at Yeongsanjeongsa Temple. A beautiful ornamental pot that sits outside of the pagoda. The first floor hall inside of the pagoda with all of the monks’ paintings on display. A look at an Indian-looking statue of Gwanseeum-bosal. A contemplative statue of Mireuk-bul (The Future Buddha). One of the more amazing shaman paintings I’ve seen at a Korean temple. It has all the major players if you look close enough at it. Another beautiful painting that hangs inside of the pagoda. This is a beautiful rendering of Chilseong (The Seven Stars). In total, there are three Chilseong paintings at the temple. The rows upon rows of sari (monks’ remains). The view from the fifth floor of the pagoda. The waterfall between the two halls at the temple. And the moon rock-looking Buddhist statue that sits in the middle of the waterfall pond. The rudimentary Ten Kings of the Underworld paintings around the Myeongbu-jeon hall. Two monks looking at the Dantesque painting of the journey from hell to heaven inside of the Myeongbu-jeon hall. Two, of the seven, depictions of Jijang-bosal (The Bodhisattva of the Afterlife) inside the Myeongbu-jeon hall. Just one of the paintings from the set of Palsang-do paintings. Inside the amazing main hall, and a look at the main altar statues and paintings. A look at Mireuk-bul (The Future Buddha) with the honey-combed painting at his back. The beautiful Chilseong (Seven Stars) painting inside of the main hall. And one last look up at the pagoda through the canopy of paper lanterns at Yeongsanjeongsa Temple. The beautiful neighbouring ocean as seen from Haedong Seongchuisa Temple in Gijang, Busan. 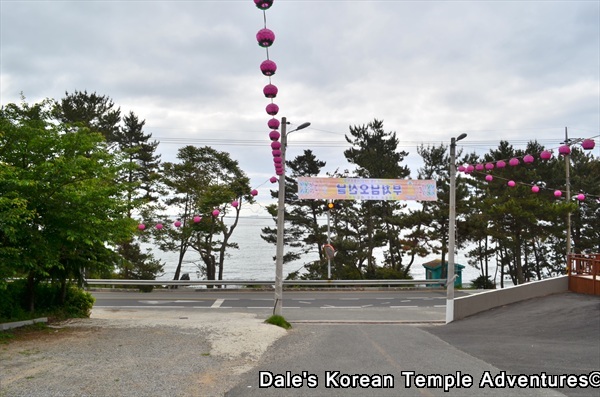 Having already visited a couple of other temple’s by the sea in Gijang like Haegwangsa Temple and the famous Haedong Yonggungsa Temple, I thought I would push my luck and see what Haedong Seongchuisa Temple had to offer. However, I think I might have stretched my luck with this temple. 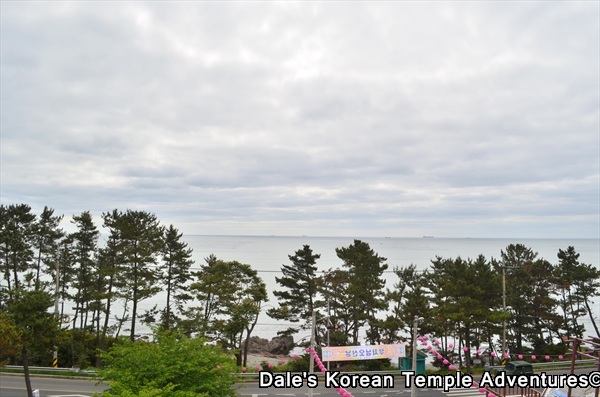 When you first arrive at Haedong Seongchuisa Temple (해도성취사), you’ll be greeted by a beautiful view of the neighbouring ocean in front of you. While not right on the ocean, it has some beautiful views of the ocean from about a 200 metre distance. The first thing to greet you is a rather interesting traditional drum shaped bathroom at the temple. Up the slight embankment, you’ll be greeted by the monks’ dorms to the right, as well as the bell pavilion that’s housed in the same cluster of buildings. Interestingly, and on top of the bell pavilion, is a stoic statue of Jijang-bosal (The Bodhisattva of the Afterlife). He is holding a golden staff, and you can get some of the most impressive views of the neighbouring ocean from this vantage point. Further up the embankment, and straight ahead, is the large sized two-storied main hall at Haedong Seongchuisa Temple. On the first floor, as is rather customary for smaller sized temples like this one, is the temple kitchen and visitors’ centre. As for the second floor, there are beautiful Palsang-do paintings around the exterior of the main hall. 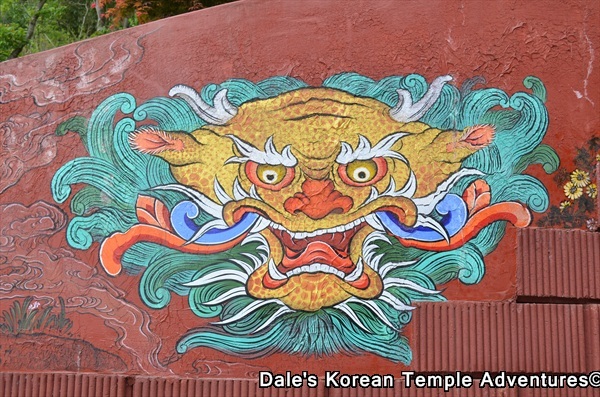 The artist that painted these murals is also the same artist that painted Guryongsa Temple in Busan and Garamsa Temple in Yangsan. He’s probably my favourite Palsang-do artist, and yet I’m not sure who he is. As for the interior of the main hall, it is rather simple in design and layout. On the main altar sits Seokgamoni-bul (The Historical Buddha). He is joined by Yaksayore-bul (The Medicine Buddha) on the right and Amita-bul (The Buddha of the Western Paradise) on the left. The interior of the hall is covered wall-to-wall by various smaller sized Buddha and Bodhisattva statues. On the far left wall is the guardian painting, and at the base of some of the walls are medium-sized statues like the statue of Gwanseeum-bosal (The Bodhisattva of Compassion) on the right wall with a swirling rainbow of colours at his back. The more interesting features of the temple, however, lay outside of the main hall. To the left rear of the main hall is a golden statue of Gwanseeum-bosal. Even though this statue is rather cheap looking in composition and design, it is surrounded by some of the more impressive paintings of the twelve zodiac signs. They are painted by the very same artist that painted the Palsang-do paintings around the main hall. To the right of the courtyard that houses this large golden Bodhisattva are two of the more interesting Sanshin-gaks and Yongwang-dangs I’ve seen in all of Korea. The shrine halls look like a bad looking make-shift army hall. It’s made out of plaster that’s been painted black and placed between two large shrubs. Inside the first shrine hall, the Sanshin-gak, is a large sized granite statue of Sanshin (The Mountain Spirit). He is backed by a beautifully rendered painting of himself. As for the second shrine hall, the Yongwang-dang, the first thing you’ll notice as you approach are two haunting golden eyes penetrating through the darkness. As you get a bit closer, you’ll realize that these set of eyes are coming from a statue of Yongwang (The Dragon King). In front of him trickles a small stream that flows into a shallow pond. To the left of Yongwang is a painting of Chilseong (The Seven Stars). And in front of this painting is a stone marker that suggests just how auspicious the land is where the temple sits. HOW TO GET THERE: Get off at Gochon Subway Station, line 4, stop #413. You’ll need to walk out exit number 4. From there, go straight for about 5 to 10 minutes until you get to the bus station. Take bus #188. You’ll need to take this bus for 32 stops, or about one hour. 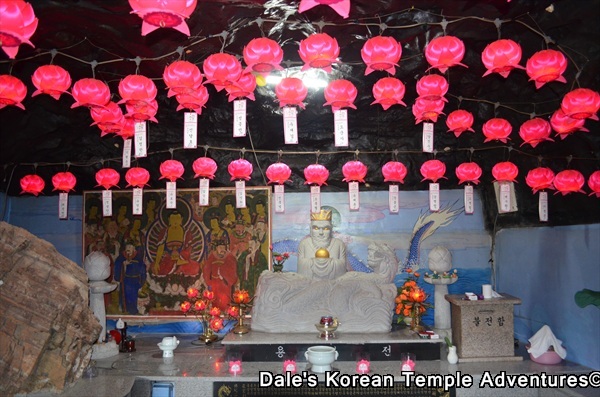 Get off at the Onjeong bus stop and walk for about 7 minutes (400 metres) to get to Haedong Seongchuisa Temple. OVERALL RATING: 5/10. I have to admit, after seeing a few pictures online, I was expecting a bit more from this temple. 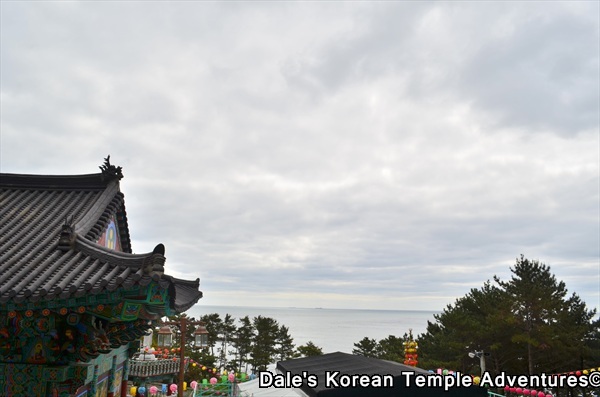 However, the nearness to the neighbouring ocean, the traditional drum bathroom, and the military black plaster Sanshin-gak and Yongwang-dang are definitely the highlights to this temple. A pretty nice view from the temple parking lot. The highly original Korean traditional drum design for the temple bathroom. The walk up to Haedong Seongchuisa Temple. The stoic Jijang-bosal (The Bodhisattva of the Afterlife) that sits on top of the bell pavilion. 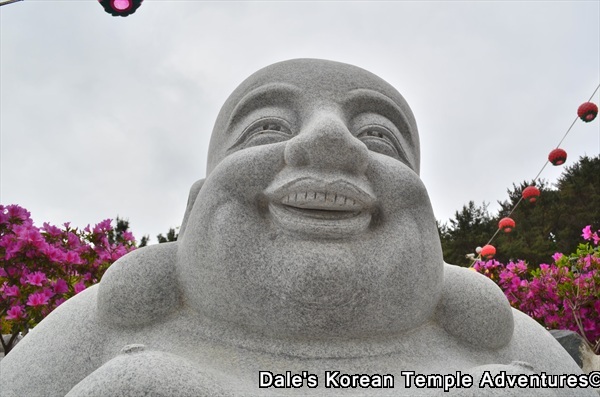 The jovial Podae-hwasang that sits to your left as you enter the temple courtyard. The two storied main hall at the temple. Just one of the highly artistic Palsang-do paintings that adorns the exterior walls of the main hall. A look inside the main hall at the altar. The Gwanseeum-bosal (The Bodhisattva of Compassion) to the right of the main altar with a rainbow of colours at her back. The large golden Gwanseeum-bosal statue to the rear of the main hall. Just one of the amazing zodiac murals at the base of the Gwanseeum-bosal statue. The view from the Gwanseeum-bosal statue with the main hall to the left and the ocean expansively ahead. And finally, the military looking black plaster Sanshin-gak. The amazingly decorative Nathwi that lies between the Sanshin-gak and the Yongwang-dang shrine halls. A look at the Yongwang-dang shrine hall. Inside the Yongwang-dang shrine hall is a statue of Yongwang (The Dragon King) to the right and a Chilseong (Seven Stars) mural to the left. 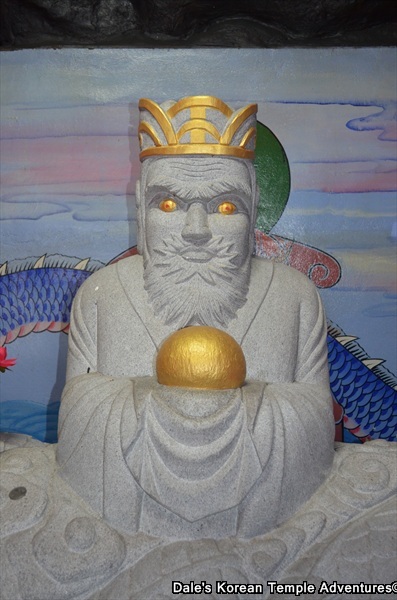 And a closer look at the eerie golden eyes of Yongwang that greet you to his shrine hall. A beautiful look through the gorgeous landscaping at Hongbeopsa Temple towards the giant golden Amita-bul statue on top of the main hall. I had seen the golden head of a giant Buddha a few times while travelling around the northern parts of Busan. 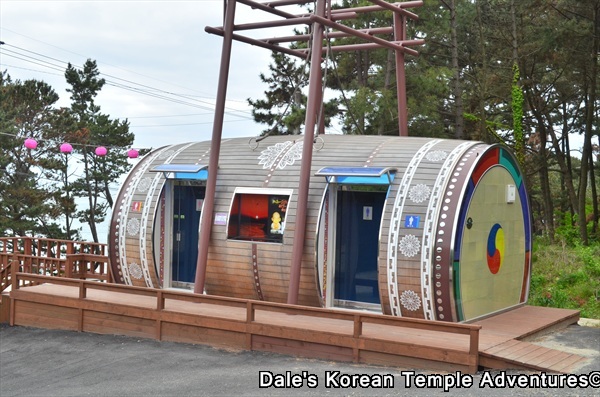 And it wasn’t until I looked at a temple blog written by a Korean that I realized that it was the ultra-modern Hongbeopsa Temple. When you first arrive at Hongbeopsa Temple (홍법사), after circumnavigating the perimetre of the temple, you find yourself in a large parking lot. And while the temple wasn’t busy on this cloudy morning, it speaks to just how busy Hongbeopsa Temple can get. As you pass through the lion-based entrance markers, the one on the left is written in Chinese characters, while the one on the right is written in Korean, you’ll notice the ever-present giant golden statue of Amita-bul (The Buddha of the Western Paradise) staring out over the temple grounds from the main hall. The first set of statues you’ll encounter are a triad of childlike stone statues that embody the idea of “hear no evil, see no evil, and speak no evil.” This is a theme that will come up later. A little further along is another beautiful statue that depicts Gwanseeum-bosal (The Bodhisattva of Compassion). And at her feet is a stone statue of a helper. As you near the modern-looking main hall, which could also be mistaken for a large sized auditorium, you’ll notice a beautifully maintained lawn and temple grounds to your right. Really, it is one of the best landscaped grounds in all of Korea. To the left is the main hall itself. In front of a large flight of stairs that leads up to the main hall is a beautiful bronze incense burner with eight decorative lions holding up the roof of the incense burner. This incense burner runs parallel with a row of perfectly placed bridges and lotus ponds. And just before you make your way up the stairs to the main hall, there’s a serenely standing golden statue of Yaksayore-bul (The Buddha of Medicine) with a handful of kids at his feet. What sets this statue apart is the waterfall that falls in front of the golden statue’s face. As you ascend the flight of stairs that leads up to the ultra-modern main hall, you’ll probably be wondering where you can gain access to this Buddhist hall. It was a question I was asking myself as I stared at the circular structure. If you make your way to the right, alongside the main hall, you’ll eventually arrive at an entrance almost completely at the rear of the main hall. To the right of the elevator that brings you all the way up to the fifth floor to where the massive statue of Amita-bul sits, is the entrance for the main hall. After taking off your shoes, you can grab either a Buddhist prayer book or a set of prayer beads. After entering into the main hall, you’ll be greeted by a low ceiling with beautiful decorative paintings as well as male Biseon. To your immediate right you’ll notice one of the more original statues you’ll ever see at a temple. The statue is a beautiful two metre long replica of the Dragon Ship of Wisdom with both a statue of Jijang-bosal (The Bodhisattva of the Afterlife) at the back of the boat with recently deceased patrons on board. If you completely turn 180 degrees from where you stand as you look at the Dragon Ship of Wisdom, you’ll be greeted by a massive prayer section inside the main hall. Sitting on the expansive main altar, and well lit from behind, are three paper lanterns that once more depict the “hear no evil, speak no evil, see no evil” theme of the statues in the courtyard. In front of these large size paper lanterns are three smaller sized golden statues with Seokgamoni-bul (The Historical Buddha) in the centre. He’s flanked by Jijang-bosal to the left and Gwanseeum-bosal to the right. Interestingly, and slightly to the right of the main triad, is a row of seven statues that depict Birojana-bul (The Buddha of Cosmic Energy) in the centre. 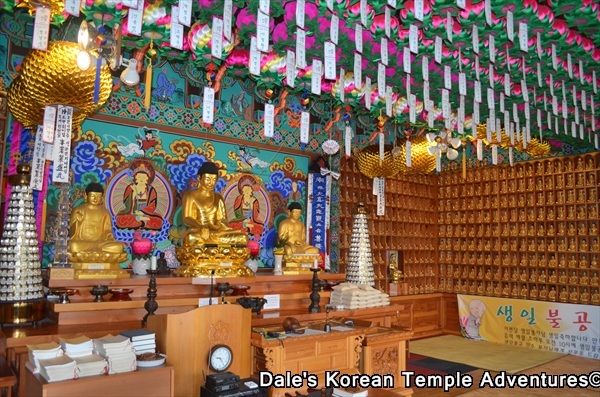 To the right of the main altar is a pastoral painting of Seokgamoni-bul praying with his disciples. Complimenting this painting, and on the far left side of the main altar, is a painting of the Dragon Ship of Wisdom. Once you’ve viewed all that you need to see inside the main hall, you can exit from where you first entered. To the left of the elevator is a set of stairs. These stairs will bring you to the top of the main hall. At the top, you’ll get an amazing view of both the serene face of Amita-bul as well as the beautiful view of the temple, Busan to the south, and the city of Yangsan to the north. After climbing the final set of stairs, you’ll get an even better view of all you had seen from the previous floor. Amazingly, you can enter inside the massive Amita-bul statue. And sitting on the altar is a gorgeous crystal palace with what looks to be a historical sari front and centre. After descending from the fifth floor, you can make your way over to the left side of the temple courtyard. To the left, again, are some beautifully maintained grounds with both cherry blossom and magnolia trees well represented. In front of the hall dedicated to San shin (The Mountain Spirit) and Dokseong (The Recluse), is a large sized coy pond with a statue of a large sized and jovial Dharma. 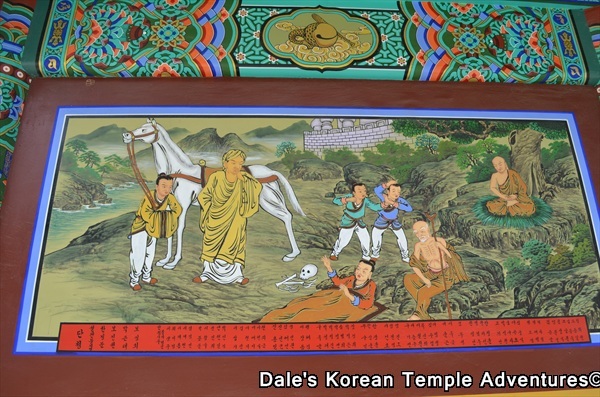 Inside of the shaman shrine hall are two newly painted, and beautifully rendered murals of Dokseong in the centre flanked by San shin to the left. Interestingly, Chilseong is noticeably absent in this shaman shrine hall. 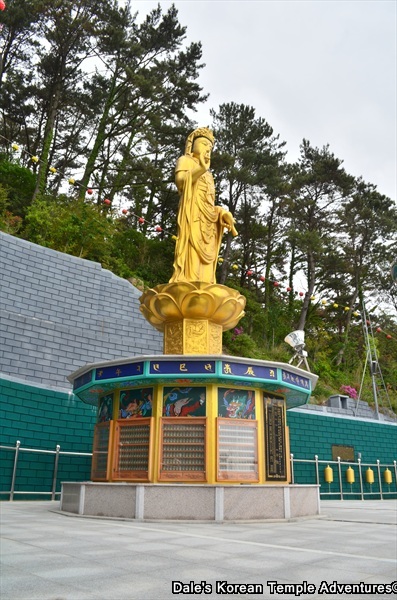 HOW TO GET THERE: There is a Hongbeopsa Temple shuttle bus that leaves from Nopo-dong Subway Station, #134 in Busan. This bus leaves every 30 minutes between 8 a.m. and 6 p.m. However, there has to be at least five people for the bus to leave the station. And to return back to Nopo-dong Subway Station, the bus leaves Hongbeopsa Temple at 15 and 45 minutes on the hour, every hour. As for lunch, buses do not leave between 11:00 to 12:15. OVERALL RATING: 7/10. Without a doubt, the highlight of this temple is the massive golden statue of Amita-bul that sits on top of the modern looking main hall. Both the artistic rendering of this Buddha of the Western Paradise, as well as the inner contents of the golden Buddha easily makes it a must see. In addition, the beautiful paper lanterns that sit on the main altar, as well as the wooden statue of the Dragon Ship of Wisdom, and the beautifully cared for grounds of the temple make Hongbeopsa Temple a must see if you’re in the northern part of Busan. The first good look at the golden Amita-bul statue as seen through the entrance at Hongbeopsa Temple. The triad of statues that represent, “Hear no evil, see no evil, and speak no evil,” with a curious Amita-bul peering over their collective shoulders. And the beautiful granite statue of Gwanseeum-bosal (The Bodhisattva of Compassion) that sits in the temple courtyard. The beautiful bronze incense burner at the temple. And a look at the neighbouring bridges and lotus streams that run parallel with the incense burner. The water that flows in front of the Yaksayore-bul (The Medicine Buddha) in front of the main hall. The beautiful, and intricate, paintings that adorn the interior of the modern-looking main hall. The highly original Dragon Ship of Wisdom statue inside the main hall. A different angle of the Dragon Ship of Wisdom. A look up at the golden main altar inside of the main hall. The customary centre triad is flanked to the right by seven statues centred by Birojana-bul (The Buddha of Cosmic Energy) and large sized paper lanterns of the “Hear no..” theme. Finally, an up close look at the giant golden Amita-bul (The Buddha of the Western Paradise) that sits on top of the modern-looking main hall at the temple. An up close look at Amita-bul’s face. And a look at Amita-bul’s mudras. And you can go inside of Amita-bul. Inside is this chamber where you can pray. Sitting on the altar is this amazing crystal palace statue. It’s fronted by what looks to be a sari. Walking away from the main hall, there are several beautifully landscaped paths at Hongbeopsa Temple. A look at the shaman hall that houses both Dokseong (The Recluse) and San shin (The Mountain Spirit). A gorgeous piece of artwork that adorns the exterior base of the shaman shrine hall. The San shin painting sits to the left on top of the main altar inside the shaman shrine hall. In front of the shaman shrine hall is this beautiful view with the neighbouring Geumjeongsan mountains and a large lotus pond with the Dharma at its centre. And one last look at the modern-looking main hall from the shaman shrine hall.